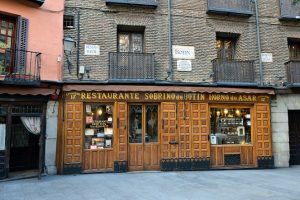 Sobrino de Botin in Madrid was one of Hemingway’s favorite places. It is one of the oldest restaurants in the world. Ernest Hemingway made a living traveling and writing about the world. From the shores of Key West to the Hills of Africa, his stories share themes of love, loss, and hypermasculinity. In Italy, Hemingway fell in love. In Paris, Hemingway found his tribe and cultivated his voice as an artist. But it was during his time in Spain that the writer discovered an everlasting inspiration. During Hemingway’s time in Paris, he visited Spain and published a series of travel pieces such as “Tuna Fishing in Spain.” In 1923, he traveled to Pamplona with his wife, Hadley, and became enamored with the art of bullfighting. The couple returned to Spain the following year with a group of friends, an event that would inspire The Sun Also Rises. In 1932, Hemingway published Death in the Afternoon, a nonfiction book about the ceremony and traditions of bullfighting in Spain. The book contains three sections: an in-depth description of bullfighting, pictures, and a glossary of terms. Contemporary bullfighting was a controversial sport during this time, and many people were quick to criticise the author’s intentions. However, the book is still received with praise by authors and critics throughout the world. A year after the Spanish Civil War began, Hemingway traveled to Spain for the American Newspaper Alliance to cover the ongoing conflict. After a series of affairs and failed relationships, Hemingway spent time in Madrid with fellow journalist and future third wife, Martha Gellhorn. He wrote his first and only play, The Fifth Column, which was thought to have been inspired by their relationship. AESU offers several trips to Spain, including Euro Explorer, Discover Spain, and Continental. Explore Spain and its spectacular landscapes. Try a variety of authentic Spanish tapas and delicacies from all over the country! This entry was posted on Wednesday, November 8th, 2017	at 11:06 am	. You can follow any responses to this entry through the RSS 2.0	feed. Both comments and pings are currently closed.